Do you remember reading one of my earlier posts titled “scenic road trips in South Island” wherein I have mentioned that the South Island in New Zealand has more breathtaking natural attractions than its counterpart North Island? I have decided to elaborate on my claim by writing about 18 most beautiful waterfalls in South Island, New Zealand. New Zealand’s rivers are creating several thrilling ‘rapids’ before forming waterfalls. I like waterfalls that are hidden from the main roads. It gives a sense of discovery. 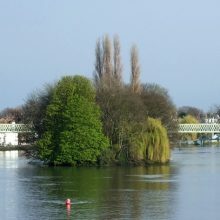 I mean, you must stumble onto water bodies than just accessing them. The waterfalls in South Island, New Zealand are mostly viewable from the main highways and thus are easily accessible. Maruia River, one of the four major rivers in Murchison town in South Island of New Zealand has naturally created the Maruia Waterfalls due to tumbling of a large block of rock. That natural phenomenon happened just after an earthquake in 1927. 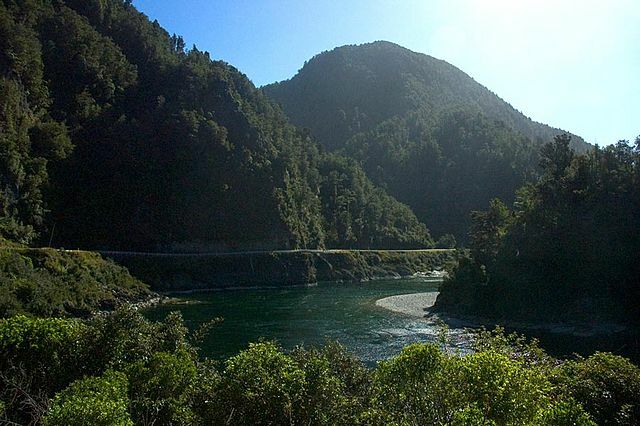 The Maruia River originated in the Spencer Mountains. It is a tributary of Buller River that flows through a scenic gorge called Sluice Box. 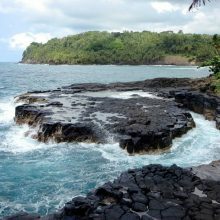 Avid road trippers don’t fail to stop at this picturesque place, spend some time, use the restroom and proceed further. Lake Wakatipu is a sprawling water body in Glenorchy town, near Queenstown, South Island, New Zealand. 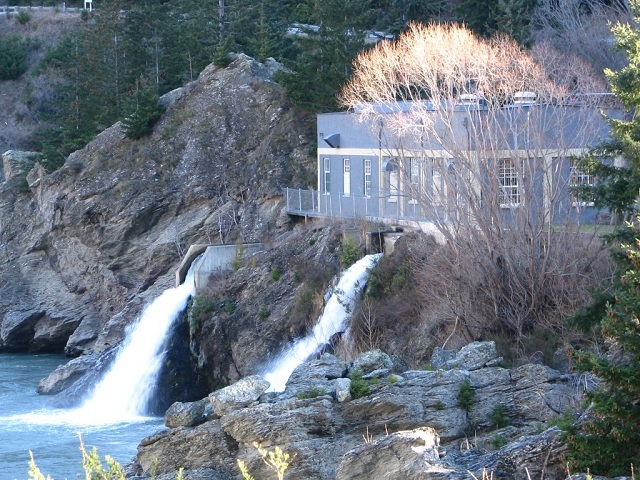 You may have to drive for about 40 minutes from Queenstown to reach the Lake Face Creek waterfall that is located on the shores of the lake and deriving its name. The waterfall drops from a height of about 80 feet and forms a cascade as it falls. 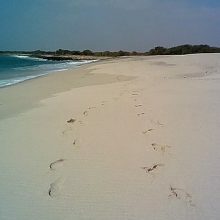 The whole place is of extraordinary beauty untouched by human disturbance. The next three waterfalls mentioned below are located very close to the Lake face Creek waterfalls. Twelve Mile Creek Falls is located just on the outskirts of Queenstown, South Island, New Zealand. You can reach the waterfalls in South Island about 15 minutes drive. An alternative way to reach the Twelve Mile Creek Falls is to trek on the Mount Crichton. It will take 2 hours to go to the waterfalls. Did you Notice the ‘rapids’ that is used efficiently by a whitewater rafter? That plunge must be very thrilling. Two Mile Creek Falls empties directly into the Lake Wakatipu. Trekkers would love to hike up to the waterfalls through Queenstown’s Sunshine Bay Walk. Just follow the road signs as you drive from Queenstown and you can reach the base of the Two Miles Creek waterfalls in just 5 minutes towards the direction of Glenorchy. Routeburn Falls gets its name from the popular walking trail named “Routeburn Track” one of three “Great walks” of New Zealand. The other two Great walks are Milford Track and Kepler Track. This Routeburn waterfalls in South Island is only 2 hours drive from Queenstown towards Glenorchy. When you are driving to Glenorchy, if it rains, you must reach the Routeburn waterfalls because the whole area wears a dreamy look, a typical Kiwi scene. The beautiful Kawarau River’s water power is harnessed here. As the power is generated, some water forms into a mini waterfall and flows into Lake Dunstan. Wainui Waterfalls is rather gentle as the water drops from a height of approximately 65 feet only. Nevertheless, I think any waterfall that is over and above 30 feet height gives immense pleasure when you stand underneath it. The Wainui Waterfalls is fed by Wainui River, in Tasmania. The cascade forms a friendly pool at its base allowing the visitors to splash in it. To visit this waterfalls in South Island, your gateway city is Nelson that is home to Abel Tasman National Park one of the national parks of New Zealand. Nelson itself is located in a lovely location on the eastern side of South Island, New Zealand. To go up to plunge pool created by the Wainui waterfalls, you need to hike a distance of 3.5 km. 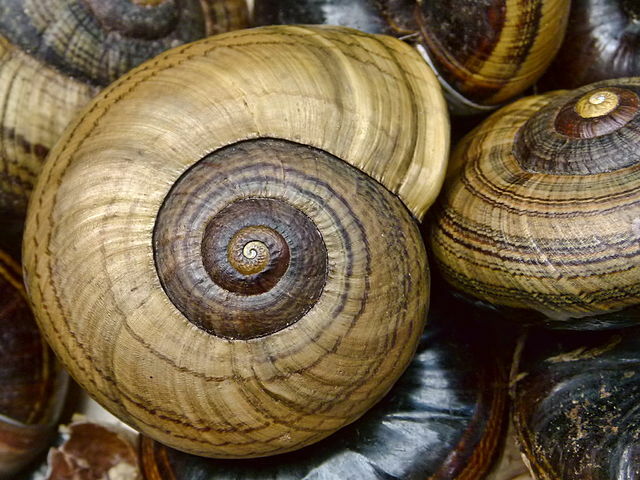 The route is lovely that meanders through a forest comprising ferns that make wonderful habitat for the giant snails. 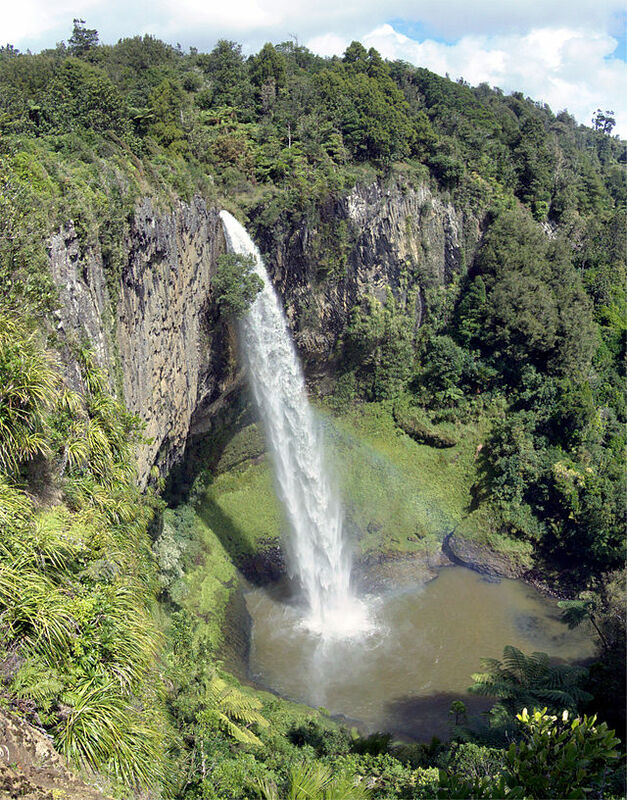 Because of the picturesque location and a wide range of flora, the Wainui Waterfalls attract visitors perennially. 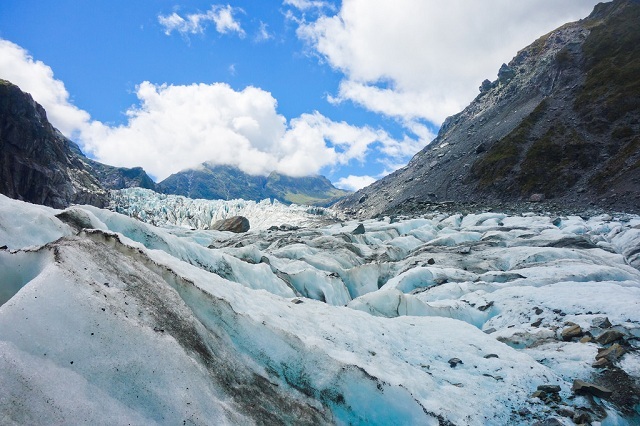 As the name suggests, the waterfall is formed by the melting glacier called Fox Glacier. The river that formed out of the melting snow was very fast once generating a huge roar. Its movement evened out the earth and the sound is almost negligible now. Very interesting fact-right? 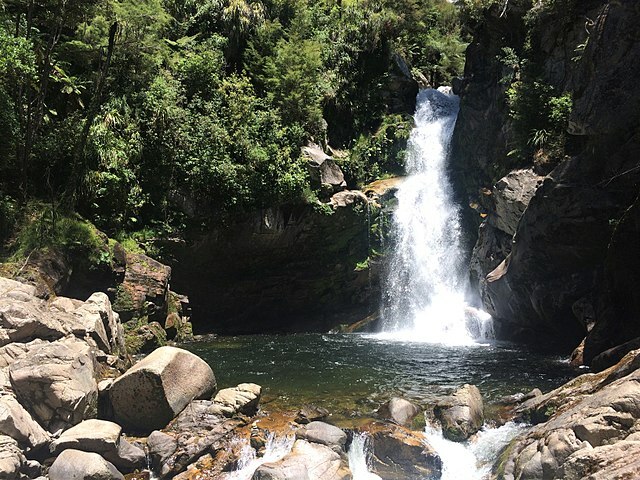 The Kiwis say this is a must-see waterfall, rather two waterfalls that you can reach in an hour by car from Nelson city towards the direction of Aniseed Valley. You need to hike for an hour or so to view the falling water. However, your trek through Richmond forest will be exciting. 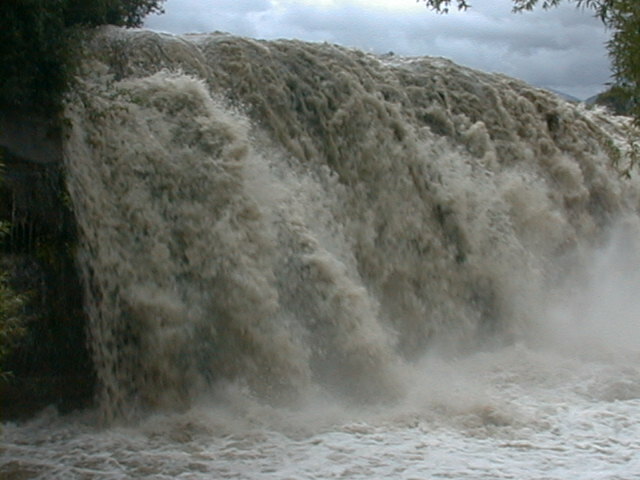 The image above indicates the name ‘waterfalls’ can be a misnomer as they are more of a cascade than a plunge waterfall. Nevertheless, they are still waterfalls, as, after all, the water is falling down and not flowing. The Purakaunui Falls are fed by Purakaunui River located in The Catlins region of New Zealand. This is a major tourist attraction in the Catlins region of South Island, New Zealand. Tourists have to walk for 15 minutes through Waikoato Valley to reach the waterfalls. In the South Island of New Zealand, Canterbury is the most picturesque region with the prominent Christchurch city as its capital. The entire region oozes with natural beauty aided by green meadows that are peaked by snow-capped mountains, and splendorous lakes. Canterbury is home to the Ohau Falls, Aoraki Mount Cook National Park, and the Tasman Glacier. What you saw on the video are the pups of fur seals, playing happily in the waterfalls, unmindful of the eyes of the tourists and their cameras. Ohau Falls don’t seem to be voluminous. The flow is rather thin and the height is at comfortable 80 feet plus. You need to walk for about 10 minutes from the main road to reach the Ohau waterfalls in South Island. Arthurs Pass National Park in Christchurch city is home to the beautiful but oddly named Devils Punchbowl waterfall. If you hire a car with a local driver, he will take you to the waterfalls in just 2 hours from Christchurch. The drop is from a good height of nearly 300 feet. The approach to the Devils Punchbowl waterfalls is through a scenic and lush beech forest. The forest walk and the sight of the spectacular waterfalls is one of the best tourist attractions in South Island, New Zealand. 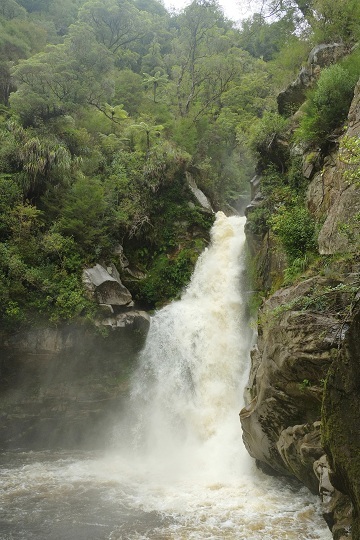 The Arthur’s National Park hosts the thundering 3-step Avalanche Creek Falls. To view all the three falls, you need to view from three different places. Unique-eh? Avalanche Creek Waterfall is located close to Christchurch. Only two hours drive will take you to the base of the waterfalls. After you have seen and appreciated the Arthurs Creek Waterfalls, just trek through the mountains for 8 minutes to see the Twin Creek Falls. Just a two minutes walk from the Twin Creek Waterfalls will get you to see the roaring Bridal Veil Waterfalls. The water starts its journey to the ground from a height of 180 feet! The Pakoka River seems to the source of this beautiful waterfalls located again inside the Arthurs National Park. Raglan is the gateway to Bridal Veil Falls. Raglan is a coastal town, located about 50 km from Hamilton, a popular city in the South Island, New Zealand. From the car park area, you need to walk for 10 minutes through a bushy track to reach the waterfalls. As you walk, the Pakoka River will give you company. The 10 minutes walk is before you start climbing down a steep flight of steps (250+) to view the waterfall. The nearby attraction includes a popular cycling trail called Pipiwharauroa Way that stretches into 6 km. 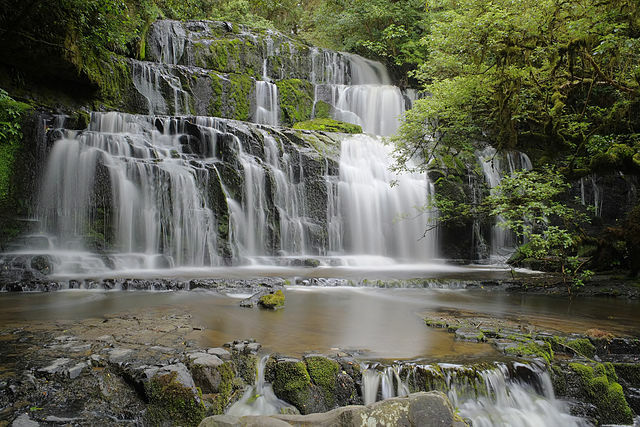 In less than an hour of drive from Christchurch, you will reach the Oxford Forest inside which is the Ryde Waterfalls. The waterfall is almost hidden from the main road but a few scenic hiking trails such as the Wharfedale Track and Coopers Creek will take you to the falls. The waterfall is falling from a friendly height only and the location is very romantic. The walk up to the waterfalls is through a dense rainforest. The one hour drive from Christchurch is not enough to access the Washpen Waterfalls. 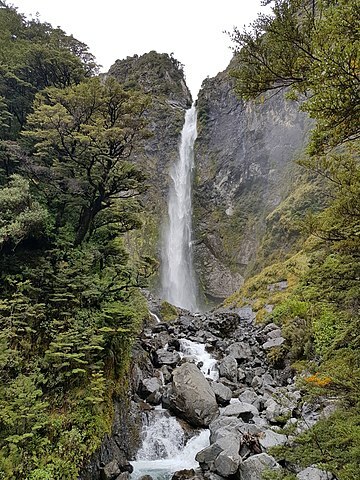 You have to trek for a minimum of 2 hours to reach the falls located in the Canterbury region. Gentle waterfalls set amidst lush green cover-eh? The Mangatini waterfall is letting out the water from a height of 80 feet! 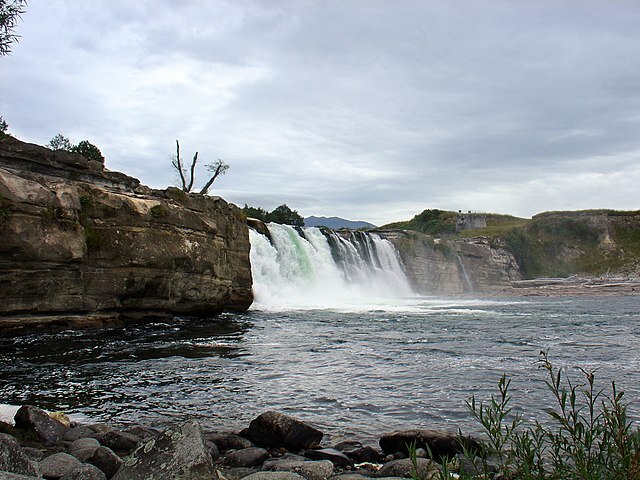 Ngakawau River feeds this South Island waterfall. You cannot take your car or two-wheeler to the waterfall; you have to walk nearly 90 minutes through the Charming Creek Walkway. If you fall in love with the falling water, the South Island of New Zealand is your best destination.